A GPS device with an OS map - and a little marker on the screen saying "you are exactly here" - is brilliant. It makes life so easy - you will never get lost again. However, paper maps are not dead yet. Here's why. There are many websites, this one for example, with free online OS mapping. However, to go walking, you will need a mobile device (satnav, pad, smart phone, Iphone, etc.) with an app to store the maps as mobile signal coverage in the countryside is very poor. While dedicated walkers' satnavs are expensive, you may already have a smartphone, and the apps are quite cheap. The problem for both is that electronic OS maps are an additional cost - an they are expensive, very expensive. The 1:50K (Landranger) scale maps are not too bad - £125 or so for the whole of the UK, but the excellent for walkers 1:25K OS Explorer series are much more expensive at £350. And there's another twist, the electronic maps are not 'open'. Buy the electronic OS maps for one app (or satnav device), and they will not work in another, so you are stuck with that 'app'/device - or you will have to re-purchase the same very expensive maps all over again. A dedicated handheld GPS device, like the Satmap Active 10, is amazing and brilliant. Rugged, waterproof, OK screen size. The only drawback is its cost - its an expensive piece of kit - about £350 with 1:50K scale maps of the entire country. And, once you've purchased it, due to the expense, you're locked in. 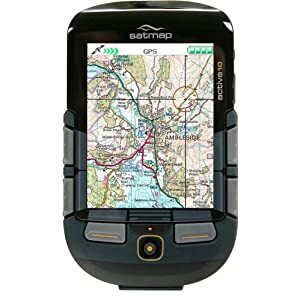 You can only use its maps on the Satmap device, and you can only buy maps for it from Satmap. Memory-map and Garmin also have handheld GPS devices, but they are definitely not recommended. The other option is an app for your existing Smartphone (Android/Iphone) or Pad. The good bit is that there is competition for apps and tablets have larger screens. The problem is battery life. With the GPS enabled, you will only get a few hours battery life - nowhere near enough for a days walk. The design of the dedicated GPS devices have this in mind, they switch the screen off after a few secs, and don't update the GPS position so frequently. If you're walking, updating once every 10 secs is plenty. There are several companies with smartphone apps, e.g. the OS and Anquet. Memorymap does as well, but it has poor reviews. Whichever one you choose, once you purchase maps for it, you're locked in. Anquet and Memorymap both have PC applications - but they are hard to recommend when so many websites now have free OS mapping. They are much easier to use than websites, with more features like 3D effects, but both much more expensive as you have to buy the maps. The only reason for using them would be to then load the maps onto your mobile smartphone or tablet, or if you do a lot of route planning. The OS have a slightly clunky but free website called Get-a-map. You can plan routes, and print out the latest 1:25K scale mapping from it. There are many others that have similar functionality. Geo-coding and GPS Accuracy - How accurate is GPS data? Geocoding means recording the GPS location of a point (a waymark) or a route. So, you have a GPS device, like a smartphone, and want to record your route - distance and ascent. It should be really accurate - right? Stop recording your route when you are stationary. When you are stationary, the location fix is less accurate, and the device will start recording a 3 dimensional spider's walk around your location. Stop 20 minutes for a cup of tea, and it will record 2km of distance, and a few hundred feet of ascent. remove unnecessary points without loosing too much accuracy, e.g. Douglas-Peucker (easier to understand). Elevation accuracy however, isn't so good. First GPS isn't as accurate for elevation as it is for horizontal location. Second, all those small errors are significant compared to the figure you are trying to measure. For example, a 20km walk, with 20,000 points, each with 5m (clear sky) to 15m (near trees, cliffs, the 5% of the time) errors, add up to a significant proportion of the figure you need to measure. Say you are walking on a flat path, the device may measure 4, 5, 4, 5, 6, 5 , 3, 5, 3, 5, 5 (6m of ascent over 11 points, so how many over 20,000... ). The inaccuracies are much worse near trees or buildings. The way to fix this is to smooth the figures (remove the small ups and small downs). But to do this you have to remove so many ups and downs you actually remove some of the ones that really existed and that you needed to measure. It turns out that the best way by far to record elevation accurately is to actually discard the figures that your device records, and use a GPS website instead. These calculate the elevation from satellite radar measurements of the earth's surface. Google for example have an elevation service with a 50m grid of height measurements for the world's surface. Give it a location, and it will extrapolate the elevation for you. Fine, unless you are near a cliff, in which case it will say you are half way up, rather than at the top or the bottom. The OS have a contour (i.e. vector rather than grid) based product, which should be exceptionally accurate, but it is not clear which websites use it. These issues explain why there are often so many differing ascent figures for given walk. Smoothing out ups and downs of less than 5 metres will give a different figure from smoothing to a tolerance of 10, 15 or even 50 metres. There is no 'correct' answer. In summary, to measure a route accurately, mark it up on a GPS mapping website, and let it calculate the distance and altitude gain/loss for you. Height above Earth Surface (Sea Level) Altitude - "geoid" The EGM 2008 (Earth Gravitational Model) standard defines a more accurate model of the Earth's surface that takes into account local variations in gravity (caused by local differances in the Earth's density). This is equivalent to OS altitude. KML - this is what Google use - which makes it a standard as well. Google Earth can read GPX however, and all the gps apps and devices can now read KML as well as GPX. So KML is the second best choice. What to do with a GPX file?